During a plague outbreak in the 16th century, doctors started prescribing strong alcoholic beverages, which gave the sick a temporary feeling of well-being. The doses were enough to raise a dead person and were given to children as well as adults. “The perfect water to heal the plague and worms. A man is given a quarter litre, a modest person half a quarter, and a child an eighth. Take half a jug of aqua-vitae and add to it the undermentioned things: gentian tormentilla ditcamnus carlina half an ounce; cooked and skimmed honey as required.” Recipe from the “Experiments” of Catherine de Medici. 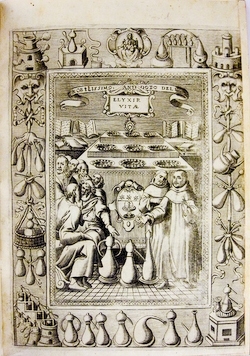 During the terrible plague which struck Northern Italy in 1630, many recipes were tried. “... it is advisable to be on an empty stomach… without wearing woollen items, since they are contagious and, in the evening, before going to bed it is a good idea to bathe a little with spring water, and even better to drink a glass of good water of life...”.